The American Southwest as we know it today would not exist without the Colorado River. Spanning 1,450 miles through the region, the river irrigates farms, creates hydro-power, provides drinking water to millions and is a source of fun and beauty in federally-recognized recreation areas and parks along the route. “We couldn’t inhabit the Southwest, with its large areas of desert, without a big river running through the middle of it,” according to to the author of a two-year-old report which found that the river is responsible for $1.4 trillion worth of economic activity. All of which is to say, government agencies need to act fast if they want to preserve the economy of the Southwest. New research from the University of Arizona and Colorado State University shows that warming temperatures are causing the Colorado River to shrink. In the 21st century, from 2000 through 2014, the river’s flow reached only 81 percent of its 20th century average, the researchers found. They attributed that change in flow to warming temperatures, saying this is the first study of its kind to trace a direct link between global warming and the decreased Colorado River flow. "The future of Colorado River is far less rosy than other recent assessments have portrayed,” co-author Bradly Udall told ScienceDaily. “A clear message to water managers is that they need to plan for significantly lower river flows." 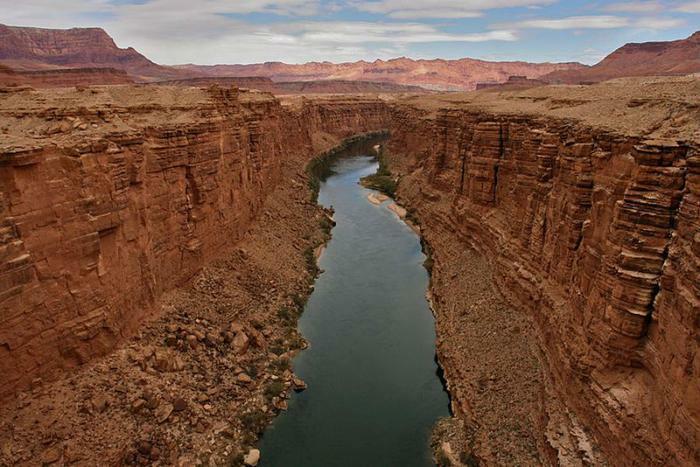 Not that previous assessments of the Colorado River have actually been rosy. A longtime drought has diminished water in the region since 2000. Government officials and researchers have warned that the agriculture industry will need to dramatically cut back on its water usage in the years to come as a result. And the Bureau of Reclamation this month forecast that there is a 34 percent chance the river will not be able to fulfill the needs of all the states depending on it in 2018. But the drought has only accounted for two-thirds of the river’s decline, according to the latest research from the Colorado and Arizona researchers. The remaining third of the loss, they say, is literally caused by climate change. Warmer temperatures have been causing the moisture in the river basin’s waterways to evaporate, according to their research. The findings mean that even an end to the drought may not restore the river to previous levels. “We can’t say with any certainty that precipitation is going to increase and come to our rescue,” Udall explained in another interview. Yet even as farmers, the real estate industry, and consumers anticipate cutbacks, conservationists worry that other industries may want to build new infrastructure along the Colorado River Basin and get their share. The Bureau of Land Management’s resource management plans currently allow for oil and gas drilling in the Colorado Basin area. Last fall, the Center for Biological Diversity threatened to sue the BLM if the agency would not promise to block all new oil and gas development in the upper basin of the river. Part of the concern, Center for Biological Diversity attorney Wendy Park tells ConsumerAffairs, is that fracking or drilling in the basin would require companies “to use tremendous amounts of water,” water she worries would likely come from the Colorado River. But there have been some hopeful developments. Since being threatened with the suit, the BLM has agreed to do a new evaluation into the effects of industry in the region, called a programmatic biological opinion, which Park anticipates will be ready in the spring.